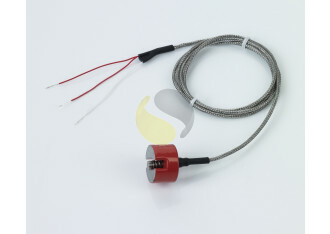 Magnetic resistance temperature detector with spring loaded tip for use in surface measurement applications. A Pt100 RTD with integral magnet designed for surface temperature measurement of ferrous metals. The magnet can be applied as a permanent sensor or ideally it can be positioned and easily moved. The spring loaded tip will ensure good connection with the surface to be measured. Available in Class A or B and supplied with a 2 metre lead wire.